Wrong. Most people are aware that diamonds enjoy the reputation of being the hardest and toughest materials on earth. But it is a common misconception that they are virtually indestructible. In fact, diamonds can be scratched, chipped and even broken if they are poorly cut or not treated with proper care. 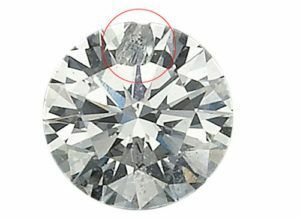 For example, if a diamond has a particularly thin girdle (the edge around the circumference of the stone), it is significantly more vulnerable to damage; the same is true if the crown, or top, of the diamond is extremely shallow. Also, consider that gem cutters cleave diamonds by striking them with the right amount of force in the right direction. A similar break can occur by hitting the stone just hard enough, say against a porcelain sink or a faucet, or dropping it on a hard surface. Care should also be taken when you are not wearing your diamond jewelry. Have a designated tray or dish to place your diamond ring in when doing household chores. And when storing your jewelry or traveling with it, separate pieces in soft cloth pouches to protect them from abrasions or breakage that may be caused by items rubbing or knocking against each other. Lastly, keep in mind that some shapes such as marquises and pears have sharp points that are often exposed in mountings and are thus more susceptible to wear and damage. It is therefore wise to consider the profession and lifestyle of the wearer when selecting a diamond shape and the style of mounting in which it will be set. For instance, someone who works in an office or classroom setting and enjoys quieter activities can safely wear a “fancy cut” diamond in an ornately set ring with a higher profile than a firefighter or personal trainer who rock climbs on the weekends. Common sense care will help ensure that your diamond jewelry stays beautiful for a lifetime! ← What if She Doesn’t Want a Traditional Diamond Engagement Ring?